This is the best premium coupe for you if you want to drive a concept car come to life. Introduced for model-year 2018, the LC is the new flagship two-door from Toyota’s luxury Lexus division. Looking almost like an exact copy of the concept car that dazzled auto-show attendees a few years ago, the LC seats four and comes two ways: as the gas-only V-8 LC 500 and as the gas/electric hybrid V-6 LC 500h. Both are rear-wheel drive, are priced above $93,000, and compete with the likes of the BMW 6 Series, Jaguar F-Type, and Mercedes-Benz S-Class Coupe. Unlike those rivals, however, the LC isn’t available as a summer-suitable convertible and doesn’t offer winter-ready all-wheel drive. 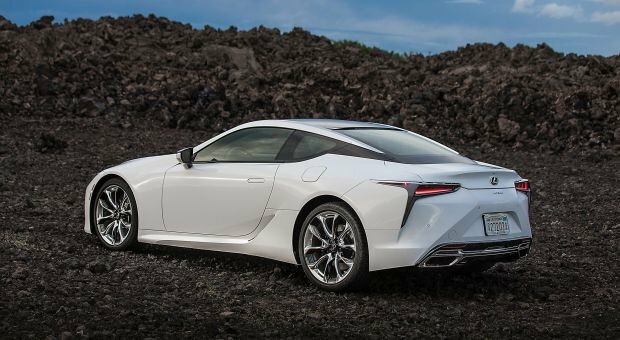 Lexus calls the LC a, “…new chapter in brand history.” It’s certainly well outside the norm of what you’d expect from a brand that built its reputation on conservative, comfortable luxury backed by pacesetting reliability and game-changing customer service. The LC’s reception has been surprisingly good, given that it’s in a relatively small market category that, like every other car segment, is under sales pressure from crossover SUVs. It’s on pace to move about 2,000 units in 2018, which is in line with its rivals, most of which are far more established in the class. The only reason to consider waiting is to see whether Lexus might offer an LC Limited Edition variant in North America. Already confirmed for Australia and Europe, the Limited has unique exterior colors and interior trim and we’d be surprised if Lexus doesn’t offer something similar in its largest market. Otherwise, the 2019 LC should be a rerun of the ’18 – though it’s likely to cost more. Styling: The LC looks virtually identical to the LF-LC (Lexus Future-Luxury Coupe) concept that debuted at the 2012 North American International Auto Show in Detroit. Styling is subjective, of course, but it looks stunning to us. The brand’s trademark spindle grille, which has received its fair share of criticism on other Lexus products, is a perfect fit in this application. It’s bold without overpowering other visual elements. L-shaped daytime running lights sweep into a pod containing three compact LED headlights. The housing then flows into the lower front fenders, creating a funnel-like shape. Door handles are integrated into the sheet metal so as not to break character lines that cut to the rear, where the funnel motif repeats arounds the taillights and fascia. The available 20- and 21-inch wheel designs strike the right balance between elegance and sportiness. It’ll run you an extra three grand, but we recommend spending it for the coolly stylish and functionally lightweight carbon-fiber roof. Each LC is made mostly by hand at the factory in Japan that produced the exotic Lexus LFA supercar. Overall attention to detail in the cabin is exquisite. Except for somewhat budget-feeling plastic trim around the steering wheel buttons, materials quality is faultless. Rich leather adorns nearly every surface, and you can upgrade the seat inserts and headliner to Alcantara faux suede. The inner door panels are asymmetrical, another nod to the LC’s concept-car roots and one of its most striking design elements. The instrument panel puts all the information the driver needs dead ahead. A tachometer dominates the pod and its appearance changes when you switch among the LC’s different drive modes. Inset into the tach are a digital speed readout and a secondary display you can customize to show performance data or other vehicle information. It’s a very efficient use of space, and the driver can so easily read it all at a glance there’s little need for the optional head-up display. Less intuitive is Lexus’ Enform infotainment system. We appreciate the central dashboard high-resolution widescreen display. Rather than a touch interface, you govern most audio and imbedded navigation functions via a laptop-style trackpad on the center console. It’s perhaps too responsive: it’s easy to overshoot the function you desire. Neither Apple CarPlay nor Google Android Auto is available. Keep in mind those smartphone interfaces are difficult to navigate without a touchscreen, so adding them to this vehicle wouldn’t necessarily be an improvement. Unfortunate, too, is Lexus’s decision to embed the front-seat heating and ventilation controls within the infotainment system. Changing these settings requires drilling to sub-menus, forcing eyes off the road for much longer than necessary. Driver and front-passenger comfort is excellent, with seats that hold you in place without feeling confining. Forget about the rear “seats.” Legroom isn’t sufficient even for little kids. In-cabin storage is sparse. The door pockets and center console compartment are small. Trunk volume is a stingy 5.4 cubic feet in the LC 500 and just 4.7 cubic feet in the 500h. The trunk is too shallow to stand up paper grocery bags and too narrow for a golf bag. Pack parsimoniously for your couple’s weekend. That’s a shame because the LC is well suited for long road trips. Mechanical: This Lexus is more a luxury grand-touring coupe than an all-out performance car. Based on our LC 500 test drive (a 500h was not available for evaluation), we believe the car largely succeeds in that capacity. The LC 500h pairs a 3.5-liter gas V-6 with a battery-powered electric motor for a combined 354 horsepower. Lexus doesn’t quote a torque figure, but it says the 500h does 0-60 in 4.7 seconds. The is not a plug-in hybrid and can’t run solely on battery power for any useful distance. The drivetrain operates like most other Toyota and Lexus hybrids, running on gas or electric power separately or in combination as sensors determine the best blend for driving conditions. The LC 500h does innovate, however, with its “Multi Stage Hybrid Transmission.” Engineers put two transmissions together: a continuously variable automatic (CVT) that’s common in many hybrid vehicles and a conventional four-speed automatic that can modulate the CVT’s output. The system simulates six gear changes while eliminating the “rubber banding” effect of a CVT that allows engine speed to race ahead of road speed. Beyond dispute is how good the V-8 engine sounds. Lexus captured the sophisticated noises you get in European rivals when accelerating but quiets things to near silence at cruising speeds. Wind and road noise are impressively low. The car’s ride/handling balance is very good as well. Even with the drive mode selector set to its aggressive Sport and Sport S+ settings, the LC is quite livable in daily commuting, even on pockmarked urban streets. Steering response is immediate, and there’s no undue body lean in fast changes of direction. It’s not quite as stable as the best European high-performance coupes in bumpy corners, but this is noticeable only at relatively high speed. Features: Every LC 500 and 500h includes 20-inch wheels, full LED exterior lighting, keyless access, pushbutton engine start, power tilt and telescopic steering wheel, leather upholstery, heated front seats, 12-speaker audio system, Lexus Enform infotainment and telematics services, and imbedded GPS mapping. Standard driver-assistance features are forward-collision warning with pedestrian detection, radar cruise control that can maintain a set following distance from traffic ahead, automatic high-beam headlights, lane-departure alert with automatic steering correction, and autonomous emergency braking. Including $1,025 destination fee, the 2018 Lexus LC 500 starts at $93,025, the LC 500h at $97,535. Most options come in packages. The $250 All Weather Package adds a windshield de-icer and a heated steering wheel. The $1,000 Convenience Package includes blind-spot alert with rear cross-traffic detection and front- and rear-obstacle detection. Forged alloy wheels of 20 or 21 inches in diameter cost $1,210 and $2,650, respectively. The Convenience Package and forged wheels are required to add the $1,790, the Touring Package, which includes Lexus’ exclusive 835-watt Mark Levinson audio system with 13 speakers, upgraded leather upholstery with ventilated front seats, and an Alcantara headliner. You need the Convenience Package, 21-inch wheels, and $390 limited-slip rear differential to add the $1,400 Sport Package, which nets heated and ventilated sport bucket seats with Alcantara inserts and a glass roof panel. The carbon fiber roof is available with the Sport Package for an additional $1,560. The $5,960 Performance Package includes everything in the Sport Package with carbon fiber roof plus carbon fiber door kick plates, variable-ratio steering, a rear spoiler that automatically raises and lowers depending on vehicle speed, and active rear steering that improves handling by subtly steering the rear wheels as needed. A head-up instrument display and the Mark Levinson audio system are available as standalone options for $900 and $1,220 respectively. Certain paint colors add $595. Our pick for best value is a $101,495 LC 500 with Mark Levinson audio, limited slip differential, 21-inch wheels, and All Weather, Convenience, and Sport with carbon fiber roof packages. EPA ratings are 16/26/19 mpg city/highway/combined for the 2018 Lexus LC 500 and 26/35/30 for the 500h. Our LC 500 test example returned 21.9 mpg in suburban commuting with more than a few jackrabbit starts away from a stop. Both LC models require premium-grade 91-octane gasoline. We expect Lexus to drop a limited edition model in North America for 2019. After that, if sales can hold at least somewhat steady, the LC is unlikely to see any major updates before model-year 2022 or 2023.